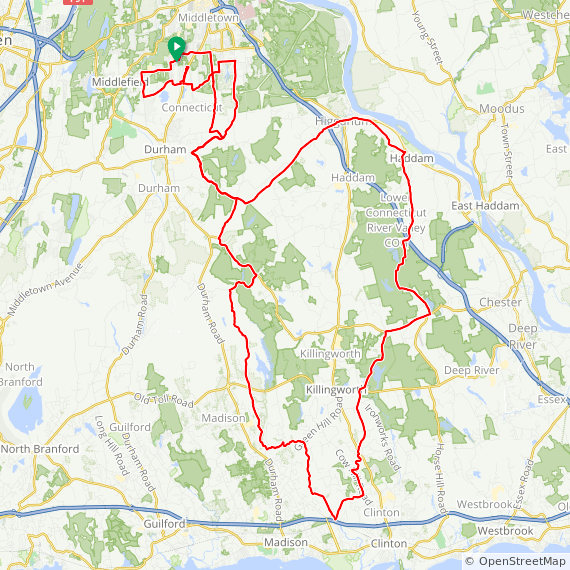 Description from CTBikeRoutes: This is a very challenging, lengthy and hilly ride that starts at Vinal Tech high School in southern Middletown, moves quickly into Middlefield before dropping south through Durham and Killingworth into Madison. It then heads north through Clinton, Killingworth, Chester and Higganum before returning to the starting point. The ride is largely over back roads with little traffic and lots of forested and rural scenery. There is just a bit of riding along state roads Rt. 17, Rt. 148, Rt. 80, Rt. 154 and Randolph Rd (Rt. 155) where you should be alert for relatively heavy and/or fast traffic. The route passes Cedar Lake and visits Haddam Meadow State Park.